The U.S. Supreme Court in its current session will consider Friedrichs v. California Teachers Association, a case that may require all states to enforce public-sector open-shop laws. Specifically a question before the court is whether to overrule Abood v. Detroit Board of Education, 431 U.S. 209 (1977) and find public-sector agency-shop clauses unconstitutional. Agency-shop clauses allow unions to collect agency fees (also called fair-share fees) from employees who are not union members but whom the union is legally required to represent. The fees are calculated as a percent of union dues. The Court in Abood upheld the constitutionality of agency-shop clauses, provided that the agency service charges are used to finance collective-bargaining, contract-administration, and grievance processes, but not for political or ideological purposes. Since World War II, 25 states have enacted so-called right-to-work (RTW) laws prohibiting the enforcement of agency-shop provisions in the private sector, and then they extended these laws to their public-sector employees. These laws create “open shops,” where all workers, union and nonunion alike, have the right to union representation but are not required to pay the union fees for that representation. If the Supreme Court overturns Abood and eliminates agency fees, it would essentially make all states right-to-work states (also known as “no-fair-share” states) in the public sector. This briefing paper responds to a claim by the Mackinac Center for Public Policy, in its amicus curiae brief, that there is not an inextricable link between exclusive representation and the agency fees that allow public-sector unions to fulfill their duty of fair representation for all bargaining unit members. “Unions are in fact able to fulfill the duty of fair representation despite whatever incentive workers might have to ‘free ride’ on the union when they do not face any agency fees,” the brief states (Mackinac Center 2015). The “free-rider” problem alluded to here involves employees who choose not to join a union but whom are legally entitled to union representation in negotiations and in grievance procedures with the employer. Free-riders are those who do not contribute to funding that representation, and free-riding is permitted in open-shop (also called “right-to-work”) states. Free-riding can ultimately undermine the collective benefits provided by unions and the existence of the unions themselves (Olson 1965, Chapter 3). Collective benefits are defined by two properties: 1) joint supply as embodied in the legal requirement that a union created by a majority vote of the workers in the bargaining unit be the exclusive representative of all employees in that bargaining unit, and 2) the impossibility of exclusion as reflected in a union’s duty to fairly represent all members in a bargaining unit whether they are dues paying members or not. For example, if, in a bargaining unit, wage rates are uniform for each job category, nonunion workers cannot be excluded from enjoying the benefits of union-negotiated wages and wage increases. Without the ability to gain payment for the collective benefits provided from collective bargaining, free-riding begins to follow the logic of collective action, thereby undermining the provision of collective benefits. In other words, as some people get benefits without paying for them, others either follow their example or get angry about the free-riders and stop paying dues, and free-riding grows. Simply put, this briefing paper asks whether agency clauses, which eliminate free-riders, are needed so that unions can carry out their obligations to serve all members of a bargaining unit. It finds that agency clauses are needed because free-riding reduces resources and thus undermines the ability of a union to serve all workers in the bargaining unit. Having fewer resources, for example, likely makes it harder for the union to pay the costs of an arbitration, which could include the costs of investigation, lawyers’ fees, the arbitrator’s fee, and staff time. The duty of fair representation is a spectrum of capabilities, not simply an act or an intention that either a union performs or does not perform, as some champions of RTW portray it (Mackinac Center 2015). The effectiveness of union representation should be judged by the quality of the contracts unions negotiate on behalf of their members. In full collective bargaining states with agency fees, there is effectively no difference between the total compensation (wages and benefits) of public-sector and private-sector employees (public workers make 0.5 percent less). In comparison, public employees in partial collective bargaining states incur a compensation penalty of 9 percent, while those in states prohibiting collective bargaining pay a 15 percent penalty. In fair-share states the compensation penalty (the penalty a worker pays for being in the public versus the private sector) is 1 percent, and it grows to 10 percent in RTW states. The RTW compensation penalty exceeds $1,000 per year for each public employee (Keefe 2015a). 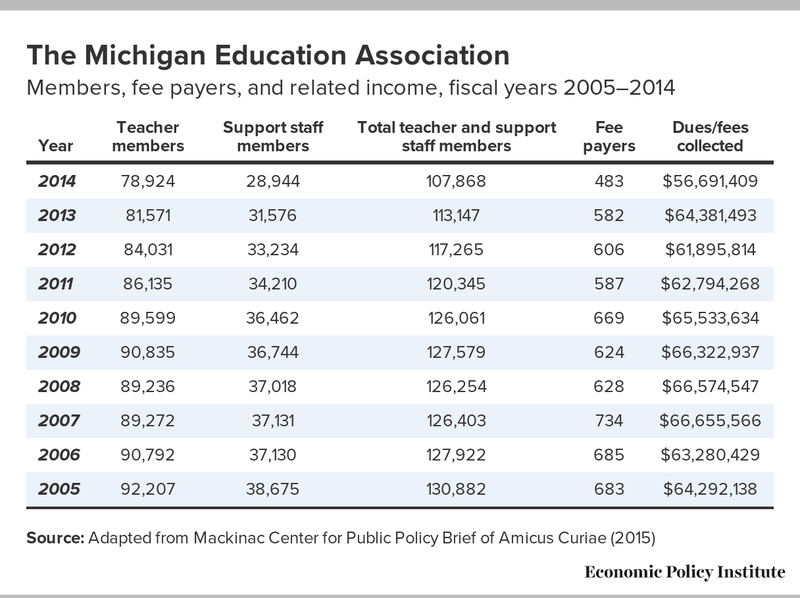 To make its case that free-riding does not undermine a union’s ability to represent its members, the Mackinac Center presents data purporting to show that the Michigan RTW law has not undermined exclusive representation by the Michigan Education Association (MEA) and the MEA’s duty of fair representation. This is its main public-sector example, and it is deeply flawed. According to the Mackinac Center, the MEA’s 8 percent decline in membership and 12 percent decline in revenue between August 2012 and August 2014 show that the union has not been impaired and therefore RTW does not undermine a union’s ability to fulfill its obligations as the exclusive representative. However, these numbers understate the impact of RTW because there is only one full year of MEA data under an open-shop mandate (Michigan Public Act 349, Michigan’s RTW law, went into effect on March 28, 2013, while Michigan Public Act 53, which prohibits school districts from collecting MEA union dues by payroll deduction, went into effect on March 12, 2012. Also, during this period, many Michigan Education Association locals had contracts that had not yet expired, as acknowledged by the Mackinac Center. If those contracts had dues-deduction and agency-fee clauses, the clauses were grandfathered until those contracts expired. This indicates that the declines in MEA membership and revenue were concentrated among that subset of MEA locals that had contracts expiring between March 28, 2013 and August 2014. That the number of agency-fee-payers declined only by 20 percent suggests that a large number of contracts permitting agency fees remained in effect. Free-riding is a contagious process, which occurs over time, not instantly. Any evaluation of the impact of RTW on Michigan’s public sector will take years. The Mackinac Center is unable to prove or disprove anything about the link between exclusive representation and agency fees in its main public-sector example. The Michigan results in the aggregate definitely indicate a growth of free-riding. Between August 2012 and August 2014, Michigan experienced employment growth of 6 percent, but union membership declined by 7 percent, and free-riding more than doubled, measured as the difference between the number of union members and those covered by a collective bargaining agreement. The early trends suggest that unions and their representational ability are being undermined by Michigan’s RTW law. Unions are more effective organizing themselves and representing their members in fair-share states. Eighty percent of public-sector union members work in fair-share states. At least 75 percent of eligible employees in full collective bargaining states with agency fees are union members. Fair-share states also have only a small number of agency-fee-payers since there is an incentive to become dues-paying members. In fair-share states, bargaining unit members vote to be union represented and they regularly vote for their representatives and ratify or reject contracts. In RTW states, public-sector union membership density is roughly one-third of that in fair-share states. Public-employee wages and compensation are also substantially lower in RTW states than in fair-share states and further below those of comparable private-sector workers (Keefe 2015a). In summary, public-employee unions are primarily for collective bargaining in most states, and there is an inextricable link between their capacity to perform that obligation as the exclusive representative of employees and the revenue they collect from their members’ dues and fair-share fees. Unions are held accountable by internal democratic processes and procedures open to all members and they can be decertified by a majority vote of their bargaining unit members. Union members ultimately determine how much to “tax” themselves as they set union dues levels, and fair-share fees are based on a percentage of what members pay in dues. Eliminating fair-share fees for public employees can only weaken their labor organizations’ capacity to represent all bargaining unit members. In conclusion, there is an inextricable link among exclusive representation, labor union membership, and agency fees that allows labor organizations to perform their duty of fair representation. These findings derive from a review of the research on RTW and private- and public-sector unionization (Sections I and II), new research on RTW effects on public-employee compensation (Section II), and the Mackinac Center’s research claiming that RTW does not undermine a union’s ability to represent its members (Section III). This paper builds on recent research by EPI finding that overturning Abood and making agency-shop clauses unenforceable would weaken public-sector employee unions, undermine their effectiveness in collective negotiations, and push public employee compensation below market levels (with the term “public employee” encompassing state and local government employees but not federal government workers or the members of the armed services). RTW legislation has been identified by a number of scholars as an important cause for the decline in national private-sector union membership (Dickens and Leonard 1985; Farber 1990; Freeman 1988; Reder 1988; Moore 1998). RTW laws contributed to the decline of unions in the states that adopted them. Ellwood and Fine (1987) report that in the first five years after the passage of an RTW law, organizing successes decline by 46 percent, and in the next five years they decline another 30 percent. Another study shows that RTW legislation substantially lowers union density, defined as the percent of employees who are union members (Hogler, Shulman, and Weiler 2004). Farber (2005), using CPS data from 1983 to 2004, reports that union density is almost double where unions are allowed to negotiate agency-shop union security provisions. Free-riding is a considerable problem for unions since they provide collective benefits to their members in terms of rules governing wages, benefits, hours of employment, and working conditions. A multivariate analysis of free-riding behavior finds that RTW laws significantly increase the level of free-riding (Davis and Huston 1993). A federal prohibition of RTW laws would reduce free-riding in RTW states by more than 50 percent (Moore 1998). RTW legislation also makes unions more vulnerable to decertification as free-riding drives membership below its necessary majority status (Hunt and White 1983). This research shows that RTW legislation inhibits the formation of labor organizations and increases the likelihood they will fail once they are established, since free-riding will deprive a union of essential resources. This is not to claim that all unions will fail in an RTW state, clearly that is wrong; however, what we observe is a select subset of labor organizations that are able to form and survive when the employees covered by collective bargaining agreements are not required to pay the costs. Money is the lifeblood of most social institutions in American society, including labor organizations. Unions need a steady flow of revenue to support staff and to provide representation services. Given the highly enmeshed complex legal environment of public-employee labor organizations, they tend to be greatly dependent on expert legal services. In addition, unions need to bargain over health and other benefits, which often require them to develop or employ financial and insurance experts. Furthermore, they need to become expert in budgets and the operations of their workplaces to recommend more efficient uses of public resources and to identify where resources are squandered, for example through inefficient privatization decisions. On a day-to-day basis in the workplace, unions work with their members to provide feedback on the complex challenges they must address, such as recruiting and retaining teachers in light of worsening teacher shortages or addressing the pressing training and safety concerns of police officers. From time to time, members raise grievances that cannot be resolved in the grievance procedure, a process of escalating negotiations that requires expertise about the respective collective bargaining agreement. In these cases, resolution may require an outside neutral arbitrator to render a binding judgement. Arbitration procedures can be costly as the union pays for attorneys, the union’s 50 percent share of the arbitrator’s fees, and for members’ paid time off to provide testimony. These are only a subset of issues for which unions may need expert assistance. To make the bargaining and representation processes work, the union must train its professional staff, officers, stewards, and members on legal and representational skills ranging from health and safety to employment and labor law, and on negotiating, problem-solving, and relationship-building. For example, Zullo (2011) concludes that construction unions are less effective at protecting member safety in right-to-work states. Overall his findings “support the hypothesis that RTW laws result in the underfunding of union safety training or accident prevention programs.” Clearly a union with more revenue per member can undertake its representative responsibilities more effectively, while those with less revenue may lack the staff, expert advice, attorneys, and ability to resolve disputes in arbitration on behalf of its members. The duty of fair representation is a spectrum of capabilities, not simply an act or an intention that either the union performs or does not perform, as some champions of RTW portray it (Mackinac Center 2015). Unions need dues and fees to support themselves to fulfill their representational responsibilities. Over time several methods to simplify the funding of labor organizations have evolved. For example, payroll dues deduction or “dues checkoff” has enabled most unions to shift their resources away from basic revenue collection and, instead, to rely on the employer’s payroll services to deduct and transfer funds, with, of course, each individual member’s consent. Even states such as North Carolina and Virginia, which prohibit public-employee collective bargaining, have permitted dues checkoff, although in 2012 North Carolina repealed the checkoff rights for public employees, as did Wisconsin in 2010 and Michigan in 2012 for school employees. More than four out of five public employees (83.4 percent) worked for a government employer that allowed dues checkoff in 2010 (Keefe 2013). RTW legislation is often championed by organized business lobbies within a state. Business interests organized by the U.S. Chamber of Commerce lobbied extensively for right-to-work legislation in the South (Miller and Canak 1991). The National Right to Work Committee, which says it engages in grassroots lobbying on behalf of freedom for choice for the “little guy,” was formed by a group of Southern businessmen with the express purpose of fighting unions (Stevans 2009). The motivation for business investment in RTW legislation has been clear: weaken unions, lower worker compensation, and raise profits, a conclusion which is supported by research. Using an event analysis, Abraham and Voos (2000) provide an empirical examination of whether stockholder wealth rises in response to passage of a right-to-work law. Stockholder wealth rose when Louisiana passed such a law in 1976 and when Idaho did so in 1985–1986. Presumably, this occurred because investors anticipated higher future profits with weaker labor unions or a lower probability of future organization. This evidence indicates that such laws are more than symbolic, that they hamper labor unions and thereby reduce workers’ share of income. While champions of RTW argue that the benefits to business of RTW will trickle down to workers, research corrected for the direction of causation finds the opposite. RTW has no influence on employment levels, and is associated with a decrease in per-capita personal income including wages and salaries (Stevans 2009). The outcome of the weakening of unions through encouraging free-riding follows from the logic of collective action, which states that an economically rational individual will seek to enjoy the collective benefits of the group without paying for them. This behavior becomes more likely as the group grows in size and as peer pressure becomes a less effective method of enforcement, meaning that large groups often fail without some other compliance methods. The logic of collective action takes over and the group then lacks the resources to provide the collective benefits to its members (Olson 1965). The private-sector research shows that RTW legislation encourages free-riding and therefore reduces the likelihood of unions to organize, to negotiate contracts, to maintain majority status, and to represent all members. Consequently, the main penalty of RTW is not what we observe in the increase in free-riders, but what we cannot perceive: fewer functioning unions even where the majority of employees may want the benefits of union representation. Research investigating the effect of RTW in the private sector is instructive; however, it may not immediately transfer to the public sector with its varied and different legal frameworks (Sanes and Schmidt 2014). In fact, the research on the effects of RTW legislation in the public sector indicates that RTW laws may be even more detrimental to public unions and their ability to provide collective goods to their members. In one unique study of the public sector, Ichniowski and Zax (1991) estimate that if RTW laws were reversed in states where they exist, the frequency of bargaining units would increase by 111 percent among police departments, 78 percent among fire departments, and 287 percent among public welfare departments. However, if states without RTW labor laws adopted them, the frequency of bargaining unions in these three departments would fall by 39 percent, 37 percent, and 66 percent, respectively. Using a different methodology, another study estimates the influence of RTW laws on whether public employees belong to a union. The study finds that RTW laws significantly reduce the likelihood of union representation of public employees as a whole and of state, fire, and police employees in particular (Hundley 1988; Moore 1998). These results for public-employee union representation should not be surprising. Without the ability to obtain payment from nonmembers for the collective services and benefits provided through collective bargaining and daily representation, union membership erodes as more people try to gain services and benefits without paying for them. The union then becomes less effective and may cease to be a viable representative. The “free-rider” problem can ultimately undermine the collective goods and benefits provided by unions and the existence of the unions themselves (Olson 1965, Chapter 3). In RTW states between 2000 and 2014, free-riders averaged 20.3 percent of public-employee bargaining units, while union membership density was only 17.4 percent. In states permitting agency-shop agreements or not barring them (i.e., fair-share or non-RTW states) only 6.8 percent were potential agency fee payers and union density was 49.6 percent (Hirsch and MacPherson 2003 updated to 2014). These estimates are based on Current Population Survey Outgoing Rotation Group (ORG), which is a population survey conducted by the U.S. Census Bureau that asks a subsample whether they are union members and whether they are covered by a labor agreement. The leading related question in the CPS survey is, “On this job, is X a member of a labor union or of an employee association similar to a union?” Workers who answer “no” to the union membership question are then asked, “On this job, is X covered by a union or employee association contract?” (Hirsch and MacPherson 2003). The respondent is answering these questions on behalf of himself or herself or other members of the household. These are the most widely cited statistics, but may result in an undercount of free-riders. For example, a free-rider might be counted as a union member if she has not discussed with her family her decision not to pay dues, or a union member might not be counted at all if she does not discuss the union with her family. One indication of the flaws in these data is revealed in states that prohibit all collective bargaining contracts. Respondents indicate that 9.4 percent of public employees in those states are union members; however an additional 3.4 percent of public-employee respondents in RTW states that prohibit contracts claim to be covered by a labor contract. In other words, 36 percent claim to be free-riders where there is no contract. This inconsistency calls into question the reliability of the CPS data. Using a different data source, the National Center for Education Statistics’ Schools and Staffing Survey (SASS), which looks at existing teacher contracts, when agency fees are not allowed, there are substantially more nonmembers who are free-riders. These data show that free-riders are 35–40 percent of employees covered by a collective bargaining agreement when agency fees are banned, and not the 20–25 percent derived from the CPS data; these data discrepancies are not easily resolved. While this paper relies on the CPS, it should be recognized that these data may systematically understate the extent of free-riding in RTW states in the public sector. Using data from the decennial census and the NBER Public Labor Law Database, I estimated that in 2010, approximately 46 percent of public employees were in states where agency-fee provisions in public-employee collective bargaining agreements were enforceable (Keefe 2015b, Table 1). However, 80.1 percent of public-employee union members were in those states (CPS ORG 2000-2014), providing evidence of another link between agency fees, union membership, and viable unions that can effectively represent their members. However, we need to go further. We need to ask, “To what end does a labor organization have exclusive representation?” In the public sector this varies. In some states such as in Colorado, labor organizations meet and confer with the employer (or in Mississippi the teacher labor organizations meet with local school boards), but they lack payroll deduction for dues and most issues are determined by legislation. Since the passage of the National Labor Relations Act in 1935, labor organizations have primarily existed for collective bargaining over wages, benefits, hours of work, and terms and conditions of employment. When we limit our analysis to states with public-employee collective bargaining accompanied by enforceable contracts and agency fees, we find starker contrasts. In full collective bargaining states, union density is 51 percent and agency-fee payers are 6.8 percent of the bargaining unit membership. It should be noted that we have not addressed what percent of public employees are eligible for collective bargaining in these states and what occupations are ineligible for collective bargaining. For example, in New York state, 72 percent of public employees are union members and another 1.7 percent are agency-fee payers. New York is the state with the broadest eligibility of coverage for collective bargaining. If we use 74 percent of employees as the upper bound of union eligibility for membership in full collective bargaining states then we can conclude at least 75 percent of eligible employees in full collective bargaining states with agency fees are union members (author’s calculations based on CPS-ORG). This wide gap in union density between RTW states and fair-share states with full collective bargaining underscores the importance of agency fees to the functioning of public-employee unions and the importance of agency fees in solving the free-riding problem. Historically, the shift from open shop to agency shop in the public sector increased all public-employee wages by 4 percent in the respective state making the change (Keefe 2013). Prior research has found that public-sector unions do raise wages of public employees compared with similar nonunion public employees. The union wage premium of 5 to 8 percent is rather modest and considerably less than the private-sector union wage effect. But the more important question is whether public employee unions are able to raise wages of workers to match comparable private-sector employee wages. This literature is limited, but almost universally finds that public-employee unions do not raise wages to meet the wages paid to similar private-sector employees. However, it is widely recognized that public employees receive better health benefits and pensions than the average private-sector worker earns. So even though union and nonunion public employees earn lower wages, public-employee unions may raise total compensation costs above comparable private employees. This is a difficult, complex issue to assess. The main research finding is that public-employee unions in full collective bargaining states (collective bargaining states that permit agency clauses) raise total compensation to competitive market standards set by the private sector (Keefe 2015a). In partial collective bargaining states, right to work states, and states that prohibit collective bargaining, public employees not only earn lower wages and compensation than comparable private-sector employers but this lower compensation may impede state and local governments from recruiting and retaining highly skilled employees for their many professional and public safety occupations. Specifically, Keefe (2015a, Table 2 and Table 3) examined the impact of different legal frameworks, including RTW, on public-employee wages and compensation. The results of this research consistently indicates that unions even in states providing full collective bargaining have not closed the public-employee wage gap with the private sector. In full collective bargaining states the wage penalty (how much less public employees earn in percentage terms than comparable private-sector employees) is 5 percent, rising to 14 percent in partial or mixed collective bargaining states and increasing to 18 percent in states where collective bargaining is prohibited. The wage penalty in RTW states is 14 percent and in fair-share states it falls to 5 percent. Given that benefits are more generous for state and local government employees, their compensation penalties are smaller than the wage penalties. In full collective bargaining states, the compensation penalty relative to private-sector employees is 0.5 percent, while for partial collective bargaining states the penalty is 9 percent, and in states prohibiting collective bargaining the penalty rises to 15 percent. In fair-share states the compensation penalty is 1 percent and grows to 10 percent in RTW states. The RTW compensation penalty (the difference between the public-sector pay penalty in RTW and non-RTW states) is in excess of $1,000 per year for each public employee. The Mackinac Center argues that RTW and free-riders do not undermine a public-employee union’s effectiveness to represent all of its bargaining unit members. The research demonstrates otherwise. Public employees in RTW states earn less—whether measured either by wages or total compensation—than both similar public employees in states with agency provisions and private-sector employees in the same state. A union’s single best test of its effectiveness is the contracts negotiated on the behalf of bargaining unit members, and the best contracts are found in fair-share states. The Mackinac Center submitted a Brief of Amicus Curiae in support of the Petition for A Writ of Certiorari in Friedrichs. The center’s brief argues that there is no inextricable link between exclusive representation, the duty of fair representation, and the agency fees that enable labor organizations to fulfill their responsibilities in supplying collective benefits to the bargaining unit. The Michigan environment is complicated, but the data do not support this proposition. The Michigan legislature in 2012 enacted two public-sector labor relations laws. Michigan Public Act 349 is a public-sector right-to-work law that went into effect on March 28, 2013. Michigan Public Act 53, which prohibits school districts from collecting union dues by payroll deduction for the Michigan Education Association, went into effect on March 16, 2012. According to the Mackinac Center’s brief, the MEA’s membership declined by 8 percent between August 2012 and August 2014 (13 percent among support staff), and its revenue declined by 12 percent in fiscal year 2013. These numbers, however, understate the impact of these laws because during this period many Michigan Education Association locals had contracts that had not yet expired. If those contracts had dues deduction and agency fee clauses, the RTW and the dues-deduction elimination would not become operational until those contracts expired. This indicates that the declines of MEA membership and revenue were concentrated among only a subset of MEA locals—those with contracts expiring between March 28, 2013 and the end of fiscal year 2013, which ended in August 2014. Table A suggests that a large number of contracts permitting agency fees remained in effect, as the number of agency-fee payers declined by only 20 percent between 2012 and 2014. Free-riding is a contagious process, which occurs over a period of time, not instantly. The Mackinac Center asserts that the MEA data show that the union is still able to perform its duty of fair representation and therefore RTW does not undermine a union’s ability to fulfill its legal obligations as the exclusive representative. However, we have only one full year of data in an environment where the RTW open-shop mandate is in effect, and only partially so. To make any evaluation of the impact of RTW in Michigan will take some years. As prior research suggests, it may take a decade or more. The Mackinac Center’s Table A is unable to prove or disprove anything about the link between exclusive representation and agency fees. The results in the aggregate definitely indicate a growth of free-riding: During this period, 2012 to 2014, Michigan experienced overall employment growth of 6 percent, but total union membership declined by 7 percent and free-riding more than doubled as measured as the difference between the number of members and those covered by a collective agreement. Overall union density in Michigan declined from 16.6 percent to 14.5 percent (Hirsch and Macpherson 2003, updated to 2014). The early trends suggest the Mackinac Center’s contention is not supported. Michigan unions and their representational ability are being undermined by RTW. The center recognizes that Wisconsin’s 2001 “Act 10” eliminated agency fees for the entire public sector except for “public safety” employees. Public-employee union membership in Wisconsin declined by 29.7 percent directly attributable to the Act 10 limitations on public-employee rights and the American Federation of State, County and Municipal Employees (AFSCME) reports a 70 percent decline in Wisconsin membership (Samuels 2015). One-third of Wisconsin teachers stopped paying dues two years after Act 10; by 2015, the share that had stopped paying dues exceeded one-half. Act 10 also included other features that made collective bargaining difficult or impossible. The act limited collective bargaining to wages only, with any increases not to exceed the rise in consumer prices; it eliminated payroll deduction of dues; and it required a union to demonstrate annually that it was the majority representative, as Mackinac acknowledges. Consequently, many unions covered by Act 10 withdrew from collective bargaining. Mackinac, however, disingenuously asserts that in Wisconsin the union “membership rate among state and local government workers covered by collective bargaining agreements has remained over 90%” (Mackinac 2015, 20). Their assertion neglects the fact that public safety employees were exempt from Act 10. They retained full collective bargaining rights, agency fees, their membership, and negotiated contacts during this period. Ironically, Mackinac is touting the success of collective bargaining with agency fees for public safety employees. In Tables B and C the Mackinac Center reports private-sector trends, which is surprising, given that there is more than adequate public-sector data to examine the question. Table B, “Percentage of Union Members Among Private-Sector Workers Represented by a Union in Right-to-Work, Agency-Fee, and Mixed-Status States, 2000-2014,” compares RTW states, non-RTW states, and mixed states. The mixed-status states include Indiana (2012), Michigan (2012), and Oklahoma (2001). Mackinac claims that there was a relatively stable 20–25 percent rate of free-riders as a share of those covered by a collective bargaining agreement in RTW states compared with agency-fee payers constituting 6.8 percent of those covered by a collective bargaining agreement in non-RTW states. That leads the center to conclude that the rate of 20–25 percent of free-riders makes untenable the claim of that free-riding erodes a union’s ability to represent its members. Again the center treats representation as a dichotomous outcome and not a set of capabilities. It is too early to assess the effects of the Michigan and Indiana RTW legal changes; however, there is one study examining the 2001 change in Oklahoma. Using a synthetic control model Eren and Ozbeklik (2011) explore the counterfactual to answer the question, “What if the state did not adopt RTW?” Their analysis of Oklahoma, which attempts to account for economic and demographic characteristic prior to the adoption of RTW in 2001 and afterwards, estimates that RTW reduced private-sector union density by 14.5 percent by 2005. Given the relatively low rate of private-sector unionization of 5.7 percent in Oklahoma in 2001 (Hirsch and MacPherson 2003), the RTW legislation decreased union density by one percentage point (to 4.7 percent). The Oklahoma public sector also became RTW in 2001 and then in November 2011, the Oklahoma Municipal Employee Collective Bargaining Act was repealed, leaving in place labor laws for school employees and police and firefighters, but eliminating collective bargaining for other municipal employees. Both the 2001 and 2011 developments demonstrate the legislative intent to restrict collective bargaining and reduce the effectiveness of unions to represent their public-employee members. More importantly, the Mackinac Center does not fully address RTW in the public sector. State and local governments provide a much more complex labor law environment than in the private sector, which is governed by the National Labor Relations Act, a legal framework that was not adopted by any state for public employees. To justify their use of private-sector comparisons, the Mackinac Center renews an old unsupported assertion that unions will lobby to increase budgetary expenditures, even though the union wage premium (how much more union members make than nonunion workers) is significantly lower in the public sector than in the private sector. So, Mackinac’s contention that public-employee collective bargaining is necessarily more powerful than private-sector bargaining is demonstrably untrue based on several decades of evidence about wages and compensation. The center also renews the stale claim that the demand for public services is more insensitive to changes in cost than private-sector services (Wellington and Winter 1971; Mackinack Center 2015). The evidence on public expenditures and collective bargaining does not support this claim either. The research on public expenditures confirms that there are few if any shifts in public expenditures attributable to collective bargaining. Using longitudinal models on data from 700 cities between 1977 and 1980, Valleta (1993) found little support for the claim that union bargaining and political activities resulted in a demand shift. Zax (1989), on the other hand, using data from 13,749 departments of city and county governments with unchanged union status between 1977 and 1982, reported that municipal unions in units with a duty to bargain were associated with a 3.1 percent greater departmental employment and an 8.5 percent greater monthly payroll per employee than departmental units without a duty to bargain. However, Trejo (1991) found evidence of simultaneity bias that contaminated previous estimates of positive employment effects by municipal labor unions. Using data on teachers union certifications in Iowa, Indiana, and Minnesota, Lovenheim (2009) examined the effect of teachers unions on school district resources. Lovenheim found no net impact on per student district expenditures. Lindy (2011) used the 1999 sunset and 2003 reauthorization of public-employee collective bargaining in New Mexico to examine the impact of mandatory collective bargaining laws on public schools. Employing a fixed-effects model, Lindy found that mandatory bargaining had no significant impact on per-pupil expenditures. Frandsen (2014) reported cross-section results showing that states with collective bargaining laws have much higher per-pupil salary and educational expenditure than states without such laws (with a 10 percent greater salary per pupil and a 12.3 percent greater educational expenditure per pupil); however, the fixed-effect models showed results that are very close to zero for all specifications of log per-pupil salary and for log per-pupil expenditure, and statistically insignificant for the most reliable estimates. This finding follows the state pattern on wages, i.e., the states with higher expenditures on education were also the states that adopted collective bargaining for public employees. Collective bargaining did not cause higher education expenditures, but it is associated with greater expenditures. This inability of unions to increase budgetary expenditure should not be surprising given taxpayer opposition to most tax increases, due to their stagnating wages. The public’s resistance to increases in public budgetary expenditures have many sources. First, many Americans do not like paying taxes, particularly when they do not understand what public services they receive in the form of public education, roads and highways, parks, and public order and safety. Second, politicians often promise lower taxes and improved services to be achieved simultaneously through cutting waste and inefficiency. This has led to a series of referendums and laws that cap tax increases, starting with Proposition 13 in California in the 1970s. Third, a wave of privatization of public services has led to a relative shrinking of the public employee workforce since the mid-1970s (Keefe 2012). These trends have placed very real constraints on public budgets and thus union bargaining power. Fourth, the public sector, particularly K-12 education, has historically taken advantage of being able to pay female employees considerably less than men. If the wage and compensation equations used in this analysis were to remove gender as a control variable, the wage and compensation gaps would be considerably greater than those reported. Fifth, state and local governments often rely on property taxes. Increases in those taxes produce immediate resistance by homeowners. Sixth, historically, state and local government jobs have provided stable employment with explicit job ladders, which is now starting to break down, but these jobs are still more stable than many jobs in the private sector, creating public envy and sparking resistance to compensation increases. Seventh, the defined-benefit pension plans in the public sector encourage employees to stay with their employers even when pay is below market levels. Eighth, some of the most difficult jobs for public employees are in the former industrialized cities with high concentrations of poor people, high crime rates, and few jobs. These cities often lack an adequate tax base to address the challenges these cities confront and thus they triage their budgetary resources. The Mackinac Center claims that the private sector RTW experience easily applies to the public sector since high labor costs are easier to manage in the public sector than the private sector. This claim is supported neither by the evidence nor common sense. Another reason we cannot apply inferences drawn from the private sector to the public sector is that legal frameworks are different. In contrast to the NLRA, except for Section 14(b), public-employee labor laws are controlled by each respective state, and in some cases even local governments, producing a range of legal frameworks that continue to evolve (Sanes and Schmidt 2014). Some states provide full collective bargaining with legally enforceable fair-share provisions, others provide limited collective bargaining or require “meet and confer” with a labor organization before implementing a personnel decision, while five states prohibit collective bargaining. It is in this complex public-employment environment that the Supreme Court has chosen to question whether fair-share provisions are linked to exclusive representation and the union’s duty of fair representation of all bargaining unit members. To meet the challenge, Mackinac Center added another public-sector collective bargaining example. The Mackinac Center selected eight RTW states that have mandated collective bargaining for their public employees requiring exclusive representation. It argues that in these eight states (Florida, Idaho, Iowa, Kansas, Nebraska, Nevada, North Dakota, and South Dakota)—with free-ridership there averaging 24 percent—the unions are able to perform their duty of fair representation (free-rider estimates are from the author’s calculation of CPS ORG data). These states account for 10 percent of public employees and 6.7 percent of public employees union members in the United States. The center offers no analysis of the effectiveness of union representation in these states. What we can evaluate is union density. In these eight states, union density averaged 24 percent between 2000 and 2014, while in states with comprehensive collective bargaining including exclusive representation with agency fees (and thus requiring the duty of fair representation), union density was 51.4 percent and agency-fee payers were 6.8 percent of the bargaining unit membership. In other words, in full collective bargaining states that allow agency fees, the rate of union membership is more than twice the rate of union membership in the eight selected RTW states, and the rate of those supporting collective bargaining in dues and agency fees (58.2 percent) is 2.4 times the rate in the eight RTW states. The potential union capabilities in the agency states are considerably greater and this is in part reflected in the fact that that unions have raised public-employee compensation to market levels. In the Mackinac Center’s view, a 20 to 25 percent rate of free-ridership (15 to 20 percentage points greater than the rate of agency-fee payers in fair-share states with full collective bargaining) does not undermine a union’s ability to fulfill its duty of fair representation. The research presented in this paper demonstrates otherwise. Eighty percent of public-sector union members work in fair-share states, and these fair-share states employ only 60 percent of the public-sector workforce (Author’s calculations CPS-ORG 2000-2014). These members voted to be union represented and they regularly vote for their representatives. Public-sector union membership density in RTW states is roughly one-third the density in fair-share states. Public employee wages and compensation are substantially lower in RTW states and further below wages and compensation of comparable private-sector workers (Keefe 2015a). Unions are primarily for collective bargaining, and there is an inextricable link between their capacity to perform their obligation as the exclusive representative of employees and the revenue they collect from their members’ dues and fair-share fees. Unions are held accountable by internal democratic processes and procedures open to all members and they can be decertified by a majority vote of their bargaining unit members. Union members ultimately determine how much to “tax” themselves as they set union dues levels with fair-share fees based on a percentage of what members pay as dues. Eliminating fair-share fees for public employees can only weaken their labor organizations’ abilities to fulfill their duties to represent all bargaining unit members. In conclusion, there is an inextricable link among exclusive representation, labor union membership, and the agency fees that allow labor organizations to perform their duty of fair representation. —Jeffrey Keefe is a research associate of EPI and professor emeritus, School of Management and Labor Relations, Rutgers University. Keefe has a Ph.D. from Cornell University and has published over 40 articles on public-sector labor and employment relations. Abraham, Steven E., and Paula B. Voos. 2000. “Right-to-Work Laws: New Evidence from the Stock Market.” Southern Economic Journal, vol. 67, no. 2, 345–362. Davis, Joe C., and John H. Huston. 1993. “Right-to-Work Laws and Free Riding.”‘ Economic Inquiry 31, 52–58. Dickens, William T., and Jonathan S. Leonard. 1985. “Accounting for the Decline in Union Membership, 1950–1980.” Industrial and Labor Relations Review 38, 323–334. Ellwood, David T., and Glenn Fine. 1987. “The Impact of Right-to-Work Laws on Union Organizing.” Journal of Political Economy 95, 250–273. Farber, Henry S. 1990. “The Decline of Unionization in the United States: What Can Be Learned from Recent Experience?” Journal of Labor Economics 8, 1, Part 2. Farber, Henry S. 2005. “Union Membership in the United States: The Divergence between the Public and Private Sectors.” Princeton University Industrial Relations Section, Working Paper #503. Freeman, Richard B. “Contraction and Expansion: The Divergence of Private Sector and Public Sector Unionism in the United States.” Journal of Economic Perspectives 2, 63–88. Hirsch, Barry T., and David A. Macpherson. 2003. “Union Membership and Coverage Database from the Current Population Survey: Note.” Industrial and Labor Relations Review, vol. 56, no. 2, 349–54, updated with The Union Membership and Coverage Database, www.unionstats.com. Hogler, Raymond, Steven Shulman, and Stephan Weiler. 2004. “Right-to-Work Legislation, Social Capital, and Variations in State Union Density.” The Review of Regional Studies, vol. 34, no. 1, 95–111. Hundley, Greg. 1988. “Who Joins Unions in the Public Sector? The Effects of Individual Characteristics and the Law.” Journal of Labor Research 9, 301–323. Hunt, Janet C., and Rudolph A. White. 1983. “The Effects of Right-to-Work Legislation on Union Outcomes: Additional Evidence.” Journal of Labor Research 4, 47–63. Ichniowski, Casey, and Jeffrey S. Zax. 1991. “Right-to-Work Laws, Free Riders, and Unionization in the Local Public Sector.” Journal of Labor Economics, vol. 9, no. 3, 255–275. Keefe, Jeffrey H. 2012. “Public Employee Compensation and the Efficacy of Privatization Alternatives in US State and Local Governments.” British Journal of Industrial Relations, vol. 50, issue 4, 782–809. Keefe, Jeffrey H. 2013. “A Reconsideration and Empirical Evaluation of Wellington and Winter’s The Unions and The Cities.” Comparative Labor Law and Policy Journal 34, 251. Keefe, Jeffrey. 2015a. Eliminating Fair Share Fees and Making Public Employment “Right to Work” Would Increase the Pay Penalty for Working in State and Local Government. Economic Policy Institute Briefing Paper #408. Keefe, Jeffrey. 2015b. Laws Enabling Public-Sector Collective Bargaining Have Not Led to Excessive Public-Sector Pay. Economic Policy Institute Briefing Paper #409. Lindy, Benjamin A. 2011. “The Impact of Teacher Collective Bargaining Laws on Student Achievement: Evidence from a New Mexico Natural Experiment.” Yale Law Journal 120, 1130–1191. Lovenheim, Michael F. 2009. “The Effect of Teachers’ Unions on Education Production: Evidence from Union Election Certifications in Three Midwestern States.” Journal of Labor Economics, vol. 27, 525–587. Mackinac Center for Public Policy. 2015. Brief of Amicus Curiae Mackinac Center for Public Policy in Support of Petitioners, Rebecca Friederichs, et al., v. California Teachers Association, et al., No. 14-915. Moore, William. 1998 “The Determinants and Effects of Right-To-Work Laws: A Review of the Recent Literature.” Journal of Labor Research, vol. XIX, no. 3. National Center for Education Statistics. Schools and Staffing Survey (SASS). Olson, Mancur, 1965. The Logic of Collective Action: Public Goods and the Theory of Groups. Cambridge, MA: Harvard University Press. Reder, Melvin W. 1988. “The Rise and Fall of Unions: The Public Sector and the Private.” Journal of Economic Perspectives 2, 89–110. Ruggles, Steven, J. Trent Alexander, Katie Genadek, Ronald Goeken, Matthew B. Schroeder, and Matthew Sobek. Integrated Public Use Microdata Series: Version 5.0 [Machine-readable database]. Minneapolis: University of Minnesota, 2010; Current Population Survey (CPS). Samuels, Robert. 2015. “Walker’s Anti-union Law Has Labor Reeling in Wisconsin.” Washington Post, February 22. Sanes, Milla, and John Schmitt. 2014. Regulation of Public Sector Collective Bargaining in the States. Center for Economic and Policy Research. Stevans, Lonnie K. 2009. “The Effect of Endogenous Right-to-Work Laws on Business and Economic Conditions in the United States: A Multivariate Approach.” Review of Law and Economics 5:1. Trejo, Stephen J. 1991. “Public Sector Unions and Municipal Employment.” Industrial and Labor Relations Review, vol. 45, 166–180. Valletta, Robert G. 1993. “Union Effects on Municipal Employment and Wages: A Longitudinal Approach.” Journal of Labor Economics, vol. II, no. 3. Valletta, R.G., and R.B. Freeman. 1988. “The NBER Public Sector Collective Bargaining Law Data Set,” Tables 1A-1E on pages 400–403 (appendix B in When Public Employees Unionize, Richard B. Freeman and Casey Ichniowski, eds., National Bureau of Economic Research and University of Chicago Press). Wellington, Harry H., and Ralph K. Winter. 1971. The Unions and the Cities. Washington, DC: The Brookings Institution. Zax, Jeffrey S. 1989. “Employment and Local Public Sector Unions.” Industrial Relations 28, 21–31. Zullo, Roland. 2011. “Right-to-work Laws and Fatalities in Construction.” WorkingUSA: The Journal of Labor and Society, vol. 14, 225–234.